I could do but how many times have you flown with a tanker in the last 12 months? It takes time to add, set up in scenery and test. It also adds polygons. It's really a question of the overhead v the sustained benefit to the user. Well I can't speak for others but personally speaking I fly with them quite a lot since you can incorporate them into tacpack so you can spawn a tanker that will actually transfer you fuel. If I took an average over a month of flying most weekdays it'd probably be twice a week. I like it because it's challenging. At the end of the day it's up to you of course John, would just be nice. OK if there is a demand for it, I can do it. The only other problem I think from Victor tanker experience, is that the parking radius has to include the trailed hose, even though it's not displayed on the ground. That makes it very big if I remember rightly. 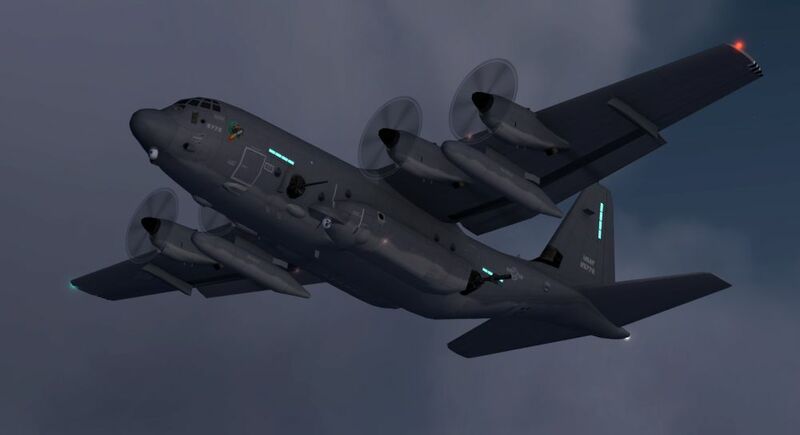 John, I have been curious to know if your AC-130 will have guns or just texture where the guns would protrude from the fuselage? 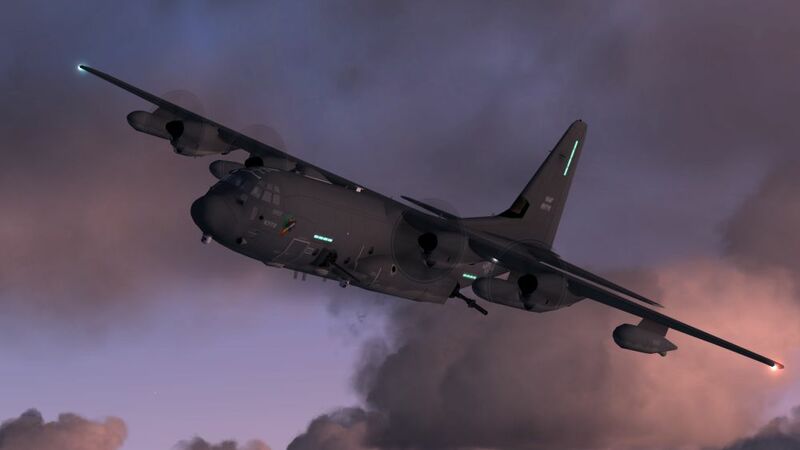 Also, will the MC-130s have the modified nose? I personally never fly with a tanker. 99.9999% of my flying is low and slow. There are lots of tankers already out there. I would be happier with better frame rates. Flyerkg, my AC-130J has two sets of detailed 3-D guns plus all the other lumps and bumps that feature on this particular aircraft. The nose on the MC-130J is no different to the other "J" models. The MC-130E/H had the "beaky" nose. Progress to date (FS9, FSX and P3Dv4 models), screen shots are FSX. Next job is to paint the full 13 x J-30 aircraft for Brent's in progress Yokota scenery. Then I'll make the KC-130J's and Harvest Hawks for Iwakuni. After that the EC-130J with it's lumps. bumps and fin aerials. The easiest will be the HC-130J for the USAF and Coast Guard and the WC-130J's of the Hurricane Hunters. Those look amazing John. Super excited about this project. John, Excellent photos! And thank you for the follow-up response to my questions. Looks superb John. It will be a pleasure to have them in my sim. These are definitely the "mutt's nuts" John. Fantastic work as usual. It is not possible to manufacture commercial model like this. The ROKAF will also operate the C-130-30 model. I want to paint & let's fly. No sure, but I don't think these will add many to Brize Norton. I don't recall John mentioning the C.Mk4 and C.Mk5 in the versions he said he was doing. Designated Hercules C.Mk 4 (C-130J-30) and C.Mk 5 (C-130J) in RAF service, these aircraft have Inflight-refuelling probes installed as standard. The type’s improved range enables most sorties to be flown without the characteristic underwing fuel tanks of the legacy versions. He didn't but he might. Let me finish the USAF/USMC examples first and get them out. I'll take a look at the RAF ones after that and see what they involve. The refuelling probe and the missile warning sensors are not a problem, so it might be quite a straight forward job. Possibly Pete, but perhaps more a patriotic inclination.